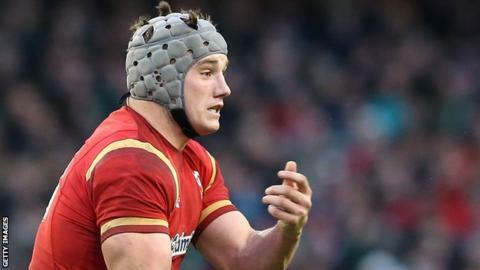 Wales centre Jonathan Davies is back in training for Friday's Six Nations visit of France after a hip injury saw him miss Clermont's match on Saturday. Assistant coach Rob Howley has confirmed wing George North has been training in midfield as a precaution. Lock Luke Charteris is doubtful as he recovers from a knee injury and Cory Allen requires an X-ray on an ankle. Fly-half Rhys Priestland, who suffered a dead leg for Bath on Saturday, took part in non-contact training on Monday. If Davies does not come through his fitness check then Northampton wing North, who has started three Tests at centre, including Wales' victory over France in Cardiff in 2014, looks likely to move inside. "We've run George at 13, he has trained there this morning and that's one of our options," Howley confirmed. If North does switch positions, Wales have wing options of Blues pair Alex Cuthbert and Tom James or Dragons youngster Hallam Amos - all three of whom were released for regional duties last weekend. Wales could also switch full-back Liam Williams to wing and bring in Gareth Anscombe or Matthew Morgan at full-back. "I think there's a selection dilemma anyway, all three were released," Howley added. "The Blues game against Leinster was (played in) very difficult weather conditions, it was difficult in terms of the ball getting into the wide channels, but both Tom and Alex acquitted themselves very well. "Hallam's come back from a long-term injury, he hasn't got the miles on the clock and it's important for Hallam to play." Wales have not called in any centre replacements despite the doubt over Davies, the injury to Allen and the fact Tyler Morgan has not played since the World Cup. "Jonathan Davies is training this afternoon [Monday] with us, so we'll wait and see how he comes through that session," said Howley. "Jon's an experienced Lions player so it'll be great news when he comes through the session. "We're disappointed to lose Cory Allen, but we're hopeful it won't be as bad as first thought." Howley also said a decision will be made later in the week on Charteris' fitness. Bradley Davies has been Wales' replacement lock in the first two matches, while Jake Ball is now back in full training after a knee injury in December. Dominic Day and James King are Wales' other options in the second row.